A review of Kochi-Muziris Biennale that opened last December. The Biennale is open to public till March 29, 2019. Durgabai and Subhash Vyam, Installation view at KMB 2018. Image Courtesy of the Kochi Biennale Foundation. What happens when you make space for art? I’m no physicist, but I do know that space and time are intricately intertwined. In an age where we consume images rapidly, with flickering TV screens or high-speed Internet, it is almost therapeutic to engage with ‘slow’ visuals. Curator Anita Dubey in her curatorial note, titled Possibilities for a non-alienated life, talks about visual hyper-connectivity and its potential to disconnect people, about ‘Guy Debord’s warning of a world mediated primarily through images – a society of spectacle … That such a society is fascism’s main ally…’. 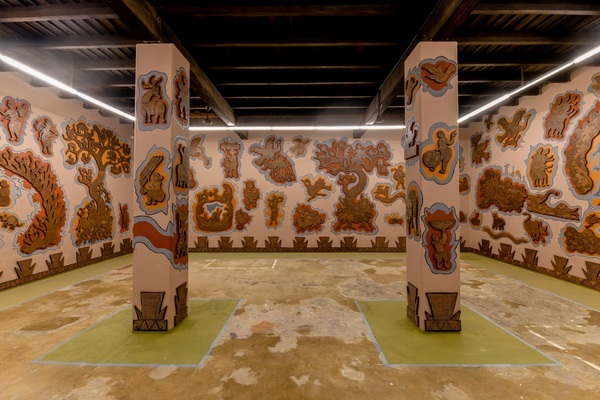 The Kochi Muziris Biennale makes this space for art in more ways than one. Spread out as it is across several main venues, the collateral projects and the students’ biennale are housed in public spaces, spice markets, antique shops and cafes where each of these spaces lend its uniqueness without disrupting the art they so gracefully host as if it were part of an old tradition. Throughout the three days I spent there, I never felt hurried or afraid of missing out. The exhibits and venues flowed in and out of one another, sometimes connected, sometimes contrasted or in a state of discord. 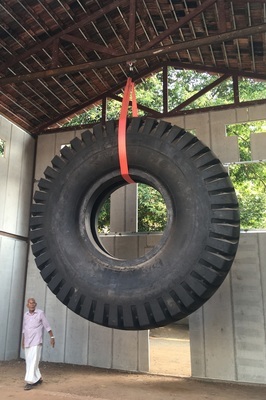 There is a lot to take in, and a lot to let simmer in the time to come, but perhaps the installation that moved me the most was the three-tonne tyre installation by Danish artist E B Itso. This massive tyre in a closed shed gives you the perspective to see what an immeasurable impact urbanisation and industrialisation make in nature. E B Itso, Installation view at KMB 2018, Photograph by Seema Massot. As I took a break on a bench at the main venue of Aspinwall House, I saw groups of students, young parents, tourists and older visitors make their way around. I realised that this is also part of the Biennale’s success, that it is accessible to a very large public across age, language and social background. But what makes the Biennale truly accessible are the ‘art mediators’, young people who are trained to give guided tours of exhibits. They showed me around as much as the others, and were as approachable as they were articulate, speaking in English or Malayalam. When art is given so much space, we can then take the time to engage with it and have the possibility of experiencing, reflecting and responding instead of looking and reacting in an almost pre-programmed manner, as it so often happens with ‘hyper-connected’ visual consumption. With space and time, we can see that in art emotions are not limited to righteous anger and offence, and it is often like a meandering river criss-crossing through spaces known and unknown. Seema Massot has been navigating the waters of cultural management between France and India since 2009 and is now writing about experiencing art.